…after 55 years – Trams are back in town! 8th of June is always going to be an historic day for tram lovers as today the first trams to run on central Auckland streets since 1956 were landed Jellicoe Wharf at the Port of Auckland. 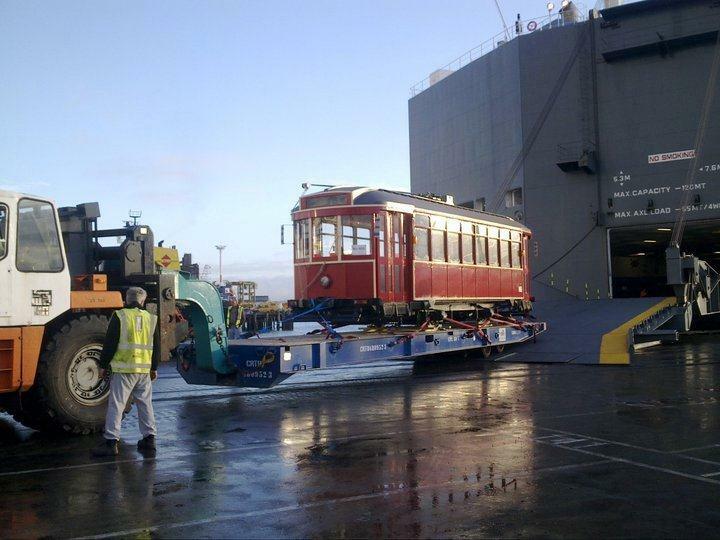 The trams beautifully restored and resplendent in traditional Auckland tram scarlet and black livery were unloaded from the car carrier mv Hoeg Beijing. Thanks to ports manager Wayne Mills I was able to inspect the new trams with the Chief Executive of Waterfont Auckland John Dalzell and Project Manager Iain Purdie. I can’t praise John and Iain enough and also tram guru Colin Zeff – they have done so much to make this happen – and happen quickly. Usually when we talk about transport projects in Auckland – we are normally talking in terms of decades (a certain Auckland Central Rail Link comes to mind). But not in this case. I still find it amazing that it was just over a year ago that I was sitting in the Melbourne office of a Mr Mike Ryan of the Victorian State Government transport department discussing the possibility of the Victorian Government making some of their heritage trams available for Auckland – and now just over one year later its happened! 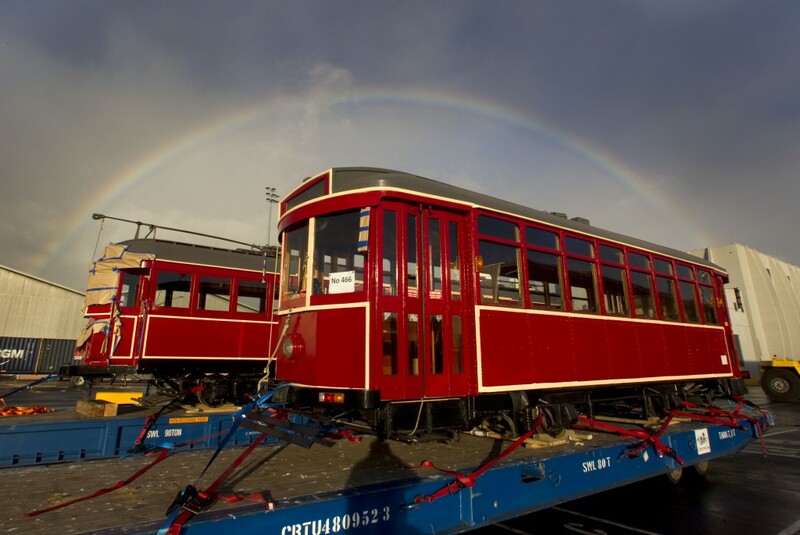 Australian-built hertiage trams - newly unloaded on the Auckland waterfront - nicely framed by a rainbow. Photograph Nigel Marple (for Ports of Auckland). The new waterfront trams are expected to be ‘launched’ and opened to the public on the weekend of 5th August. The following is an extract from Waterfront Auckland’s latest newsletter. “There’s significant work being done on the tram tracks in Jellicoe Street at present to get them ready in time for the August opening. To help with this, a unique installation technique is being used. It involves a specific type of polyurethane which gets poured into the trench which the tracks sit in. This grout acts as a shock absorber and provides significant reduction in the sound and vibration that occurs. A feature which will obviously be key for the North Wharf eateries and for foot traffic in Jellicoe Street. The arrival of these heritage trams means that this will be the first time trams have operated on central Auckland streets since 1956 when the Auckland City fathers working hand-in-glove with the pro-roads National Goverment terminated the tram fleet (physically destroying most of the trams and selling the rest as batches or sheds) and at huge cost ripped out 72km of tracks. At the time trams alone carried over 80 million out of 100 million passengers a year – a year later public transport patronage halved and has only recently showed signs of recovering. Given that Auckland’s population was then only around 400,000 and that now with a population of 1.4 million we carry 64 million passengers a year by bus, train and ferry, one can get an understanding about how popular trams once were with Aucklanders. And that Aucklanders were once per capita some of the highest public transport users in the world. Hard to believe! Here at last. 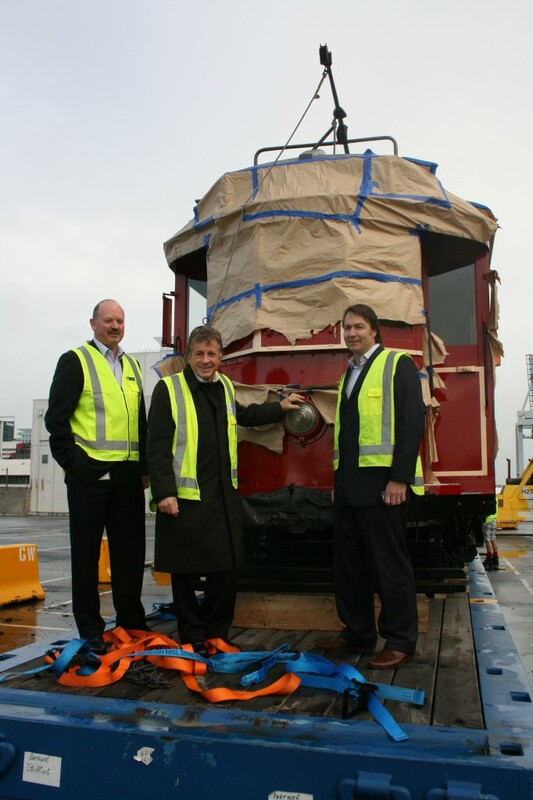 Wayne Mills Manager Ports of Auckland, Mike Lee and John Dalzell CEO Waterfront Development Agency. (Photo Martin Leach Ponsonby News). The purpose of this heritage tramway is not really public transport but to enhance and underline the heritage and character of the Wynyard Quarter – adding an attractive family-friendly drawcard to this tourist precinct soon to be open to the public in time for the Rugby World Cup. There is however a serious public transport opportunity in all of this – a Wynyard tramway if linked to Britomart would make it feasable to seriously consider Light Rail as an alternative transport mode on inner city streets. Already there is interest from Ponsonby residents and also talk of LRT on Queen Street, Dominion Road and Tamaki Drive. The Auckland Council Transport Committee which I chair has already called upon Auckland Council, Auckland Transport and the Waterfront Development Agency to make extending the Wynyard Tramway to Britomart a high priority. Here is an interesting email I dug out today from sent from me to ARC chief executive Peter Winder whose active support was critical – its just over a year ago. Sent: Tuesday, 11 May 2010 6:52 p.m.
the idea of a heritage waterfront tramway was last year resolved to be one of the ARC’s legacy projects. As you will be aware it has been on the backburner for some months for a number of reasons. We have been distracted by the attention we have had to put into other projects (eg Queens Wharf) and of course by endless day to day political crisis management – but also to be fair because of difficulties around the project itself. – 3) difficulties in connecting Britomart to the Wynyard Quarter. In regard to issue 1) I trust staff have taken advantage of the interregnum to come up with some ideas on this – otherwise I have some myself. There is plenty of space around the Wynyard Quarter. In regard to issue 2) I have obtained verbal agreement from the Victorian Government officers for a recommendation to the Minister to provide us with 2 x heritage trams in good working order – albeit final touch up work would be at our expense. Also as part of the gift – spare parts would be included. Basic frames and chassis could also be provided if we wanted to recreate replica ‘Auckland trams’. In regard to issue 3) the logical answer is Te Wero bridge. However that is unlikely to happen for at least 5 years. 3) do not try to connect the Wynyard Quarter with the CBD – yet. I have come to the latter conclusion after giving this matter a lot of thought. Getting in now with a tramway which encompasses the whole quarter makes a lot of sense. A tramway running along Jellicoe, along Halsey, back along Gaunt and northward along Beaumont would be only 1.5 km long and easily affordable. It could be started relatively quickly before we leave office. On the Christchurch figures 1.5 km Wynyard Quarter tramway would cost around $6.7m. Extra costs would be incurred for garaging – though that could mean a creative solution but maybe there has been some good staff work on this. But building a tramway – even a tiny one like this will also make history in terms of catalysing the return of trams/LRT to Auckland for the first time since the 1950s. The other factor is that if we don’t do it now – I doubt it will ever happen. I would like to talk further with you about this but now feel this could be our most meaningful ARC legacy project of all. We only have a few months to achieve this but of course it is not exactly a new issue for us. I want to pay tribute to all the people whose support enabled this to happen. First of all to Colin Zeff, Cam Pitches and Barry Palmer of Campaign for Better Transport who first suggested the idea of a tramway on the waterfront in 2009. Thanks also to my fellow members of the Auckland Regional Council whose staunch support for this project was unwavering. Then lastly to the people who actually made it happen Peter Winder and John Dalzell, Colin Zeff and Iain Purdie. Finally Mike Ryan and the Victorian State Government of Australia. Thanks folks you have done Auckland proud. A past wrong has began to be put to right. 2 Responses to …after 55 years – Trams are back in town! Well done! Trams will add a vibrancy and romance to the city which is sadly lacking at the present time. Trams are international and sophisticated, buses spew diesel fumes and are particularly unattractive. The aim should be to restore the original 72km of track. Why can’t there be some sort of corporate sponsorship/partnership to keep expanding the track? The buses currently attract millions in advertising…trams could do exactly the same thing. Keep fighting for the trams…future generations will thank you! as they try to block us off on one front (central rail link) we will push ahead on another!